Cindy is a well adjusted year old cat, born in April of 2017. She has been in her foster home since her first week of birth and gets along with all ages of kids, cats, and dogs. 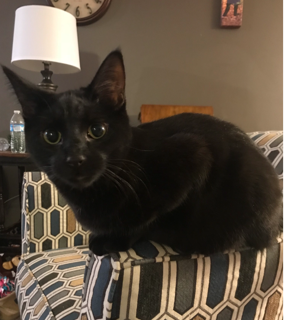 She loves to play and snuggle with other cats, (resident grumpy sister cat is NOT amused), and loves being pet BUT does not like to be picked up and held. She will curl up on your lap or at the end of the bed at her own will though......and not move for hours! She is sassy and super vocal, loves to be talked to by her fosters! If you are interested in meeting or adopting Cindy, contact Nancy at 419-450-8581.